Here is a photo of some logwood that was possibly brought over on the Mayflower. We have the bundle that is in the photograph stored in an acid free box. There is a note in my grandmother's scrapbook that says: "Logwood for dying clothing brought over in the Mayflower 1620". Mrs. Lucy Brooks Cabot, 86, wife of Norman F. Cabot, died in her home on Terrace Street this morning about 1.45 o'clock after an illness of about six weeks. She was born in Chesterfield, Factory Village, Dec. 13, 1825, and was a daughter of Capt. William S. and Elinor Forman Brooks. Her father was a native of Medford, Mass., and her mother came from Freehold, N.Y. In 1821 her father went to Chesterfield and in 1839 the family came to this town. Following the death of her mother she went south and there met Norman F. Cabot and they were married in Wetumpha [sic, should be Wetumpka], Ala., Dec. 13, 1853. Previous to the Civil war they came to Brattleboro and had since lived here, Mr. Cabot being for many years treasurer of the Vermont Savings Bank. She had two brothers and two sisters, all of whom were prominent in the town during their lives. George J. Brooks was the builder of the Brooks House and gave the Brooks library building to the town. The other brother was Francis W. Brooks and the sisters were Mrs. Francis Goodhue and Miss Malvina Brooks. 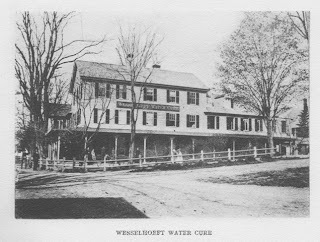 Besides her husband she leaves two daughters, Miss Mary R. Cabot of this town, and Mrs. Frederick Holbrook of Boston, and one son, William Brooks Cabot of Boston. The funeral will be held in the home Monday afternoon at 2.30 o'clock. Rev. R.M. Houghton will officiate and the burial will take place in Prospect Hill cemetery. Friends are kindly requested not to send flowers. Source: Newspaper clipping, newspaper title and location not included. Written on back: "Peterkin and his friend Danger, Brattleboro 1900"
My 3rd great grandfather is Amos Haskell. Does anyone have any information on the name "Bethulah"? I have always thought this to be a female, but the Town Clerk listed this child as a son. I was unable to locate anything definitive based on a quick search on the internet. If anyone has further information, I would be happy to hear from you. Source: A Book of Record of Births for New Gloucester in County of Cumberland Commonwealth of Massachusets from 1771 to 1865. Image taken from original record book on 12 Apr 2011 by William C. Haskell. Original record book located in Town Office, Town of New Gloucester, Maine. Happy Father's Day! My wife gave me this cross-stitch several years ago, showing 12 generations of Haskell fathers from my son back to the first William that came to Gloucester, Massachusetts with his two brothers, Roger and Mark back in 1635. I thought it would make a great Father's Day post in remembrance of all the ancestral Haskell fathers in my line. Here are some of my true faces of genealogy. The reason for this post is here. 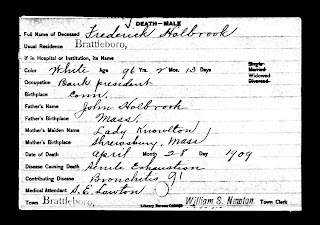 I located the death record for my 3rd great grandfather, Frederick Holbrook on Ancestry.com (accessed on 5 June 2011). Here is a transcription and digital image of the record. Vermont. Vermont Death Records, 1909-2003. Vermont State Archives and Records Administration, Montpelier, Vermont. Vermont. Vermont Death Records, 2004-2008. Vital Records Office, Vermont Department of Health, Burlington, Vermont. Enjoying a nice vacation at Big Bend National Park in Texas. The following typewritten manuscript is from my grandmother's binder on the Goodhue family. At the end of the document there is a handwritten note that says: "written by Ellen Brooks Goodhue (Mrs Henry Van Kleeck)". There is no date on the document. This will be split into several posts. William Goodhue, the first settler of the name, who emigrated in 1635, is supposed to have come from Kent in England, because the name is not found elsewhere, and because his wife, Margery Watson, was from that county. 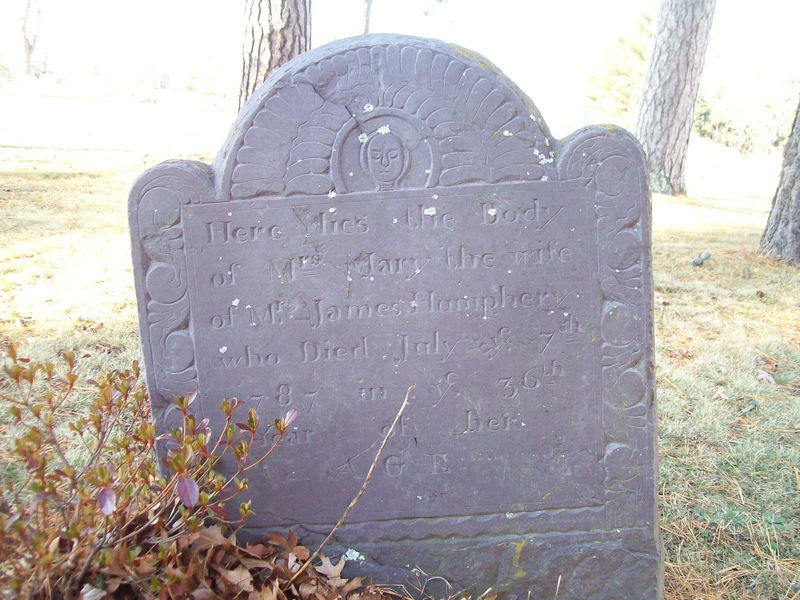 The name in England is spelled Goodhugh and Goodhew, which last method is the way it is spelled on the grave of the 2d William Goodhue in Essex, formerly called Chebacco, a part of the town of Ipswich, Mass. A mile from Seale Church in Kent is an ancient country seat called Stonepit, at one time owned by Goodhughs as was the nearby Manor of Spellhurst, and County Hill near Deptford, Kent. These country seats have passed to descendants of the Goodhughs in the female line, but none of the name were found there when visited by Mr. Jonathan Goodhue of New York in the year 1830. The house occupied in Ipswich by Rev. T. Frank Waters, Minister of the South Congregational Church, and president of the Ipswich Historical Society, was built on the site of the house built by William Goodhue the first settler, about 1639. The surrounding land, nine acres, had been bought by his wife's father--Watson, who remained in England. This was in the South village. Adjoining was the house and land of Rev. Nathaniel Ward, "The Sweet Singer of Agawam." William Goodhue was deacon and a man of importance in the community as shown by the fact of his being Deputy to the General Court in the years 1667-73-76-66-80-83. The last years of his life were spent with his son William at Chebacco, now Essex, after he had given up his Ipswich home and farm to his eldest son Joseph. See Goodhue History [History and Genealogy of the Goodhue Family in England and America to the Year 1890, compiled by Rev. Jonathan E. Goodhue, A.M., published by E.R. Andrews, Rochester, NY, 1891] for further data. Dates of service have been verified by W. K. Watkins, Genealogist, 18 Somerset St., Boston. My grandmother's family binder on the Goodhue family includes various research notes, pedigree charts, and newspaper articles The following article was apparently originally transcribed from the Vermont Phoenix, June 15, 1866. Not another instance can be named where a man has settled here, with so much risk, who manifested by his actions more real confidence in our future than Mr. Goodhue. He became eminently a Brattleboro man, completely identifying himself with our joys and sorrows, and ever ready to listen to or assist in any project having tendency to advance the welfare of the home of his adoption. We remember his climbing over hills and rocks with the surveyors of the New Haven and Northampton Canal, trying to ascertain the most feasible plan to use West river as a feeder of that canal, the extension of which at that time to this place was contemplated. The great Erie Canal, projected by Gov. Clinton of New York, had just proved a success, and the attention of intelligent men all over the country was directed to this method of communication, as in more modern times their attention has been given to railroads. We make this allusion to show that Mr. Goodhue was awake to the enterprises of the day, and spared no personal efforts to advance them. His hopefulness and cheerfulness was a constant inspiration to those with whom he came in contact. The encouraging grasp he have to the hand of industry will be long remembered. He seemed destitute of envy, and wanted every one to succeed in everything useful or needful to human wants. There was always a smile of gratification on this countenance when he saw others prosper. He did not, like some men of wealth, lose all confidence in a young man because he had been unfortunate, but he had a cheerful, encouraging way of saying: " He is young and capable: the world is before him; I hope and believe he will yet do well." His calmness and indifference under severely provoking circumstances was remarkable. Some who make great pretences or high claims to saintship, would fall far behind him in heeding the Scriptural admonition, " A soft answer turneth away wrath." The example he has left us in this matter, if universally followed would make more peaceable neighborhoods, prevent many quarrels and resorts to lawyers' offices. A man highly excited applied some severe epithet to Mr. G., in so insulting a manner that most people would, in language or action have indignantly resented it. But Mr. G. simply replied: "There are various opinions about that matter," and passed on, having business of greater importance than adding fuel to a fire already sufficiently hot. Valuable locations on his land on Main Street were freely given for the Unitarian and Orthodox Congregational Churches, and for the old Brattleboro Bank. I recently found a copy of a book in my Dad's bookcase that was apparently owned by my third great grandfather, Amos Haskell (1787-1859). The book is titled Memoirs of Roger Williams, The Founder Of The State Of Rhode-Island by James D. Knowles, published by Lincoln, Edmands and Co., Boston in 1834. My grandfather's name is written inside the front cover and there is also a small slip of paper with his name on it. I believe this is probably the oldest book on my Dad's bookshelf. The book is in remarkably good condition and was likely passed down from Amos to his son Alfred, then to Frank Owen, then to Merrill and finally to my Dad. This brings up an interesting question as to whether Amos was literate. 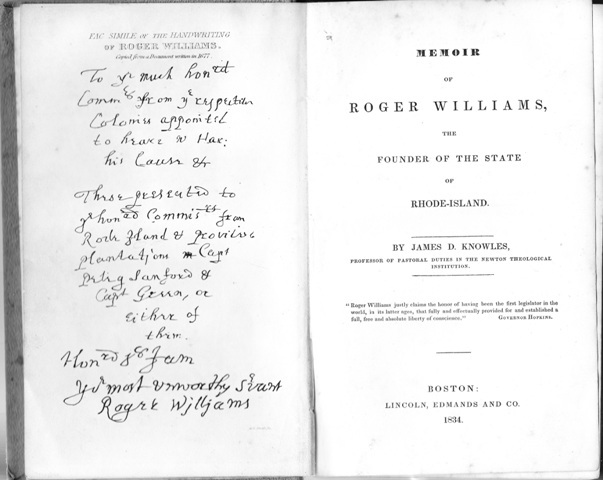 According to the book The New Century Book of Facts: A Handbook of Ready Reference, published in 1909, New Gloucester, Maine, where Amos was born had a school in 1764. So it is likely that he was literate. Were your ancestors who lived in the 18th and early 19th centuries literate? I am going to do some more digging into this question. Frederick Holbrook was the Governor of Vermont during the Civil War years. On July 29, 1862 he wrote a letter to Abraham Lincoln. Click on the link to see a digital image and transcription of the letter at the Library of Congress. The letter urges Lincoln to call up more troops to fight for the Union. Governor Holbrook thought that a million more men would be needed; however, Lincoln was calling for 300,000. Notes: Father of Reuben Merrill and grandfather of Nathaniel Edwin Merrill. My third great-grandfather. Reuben Merrill [Sr] was born 2 Aug 1765, he married Clarissa Jones about 1794. Transcription: REUBEN MERRILL/DIED/July 29, 1818, AE. 53. Saturday 19 March 2011 - I started cutting firewood for next year over at my Dad's. His farm is called Strawberry Meadows Farm - named for the wild strawberries that grow in the fields. Here are a couple photos of the farm and me cutting wood. I guess civil engineering is in my blood. My great grandfather, Frederick Holbrook, was a civil engineer and a contractor. My great granduncle, William Brooks Cabot was a civil engineer as well and was a partner in Frederick Holbrook's firm, Holbrook, Cabot & Rollins. My dad was also a civil engineer and land surveyor, and now I am carrying on the civil engineering family tradition. Here is a brief article about Frederick Holbrook that was printed in the American International Corporation Argosy in 1919. FREDERICK HOLBROOK has been a Vice-President of American International Corporation since August 31, 1916. He was placed in charge of the Russian affairs of the corporation and sailed for Petrograd in September of that year to represent A.I.C. in the investigation of Russian propositions, remaining there until August, 1817. Mr. Holbrook is President of Grace American International Corporation, formed earlier this year to engage in Russian business. He is also a Director of American International Steel Corporation and of Allied Machinery Company of America, and from March until December, 1918, was President of American International Shipbuilding Corporation. 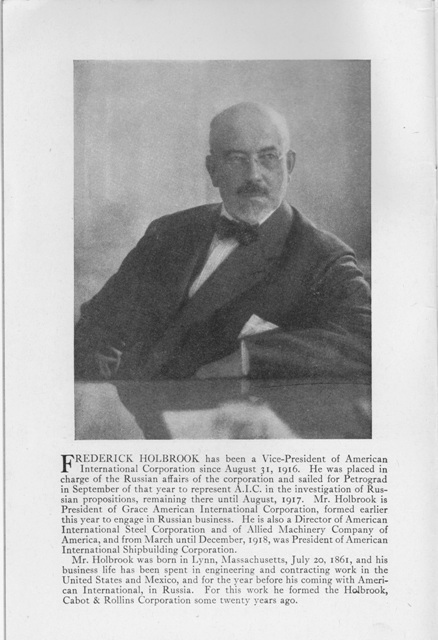 Mr. Holbrook was born in Lynn, Massachusetts, July 20, 1861, and his business life has been spent in engineering and contracting work in the United States and Mexico, and for the year before his coming with American International, in Russia. For this work he formed the Holbrook, Cabot & Rollins Corporation some twenty years ago. Source: American International Corporation. "The American International Corporation Argosy", November 1919, Volume 1, Number 7, page 2. 120 Broadway, New York. Notes: Daughter of Alfred and Elizabeth (Owen) Haskell. Sweat every morning early in a wet sheet, and after it bathe or wash in water of 72 degrees to 60 degrees. Drink cold water after it and walk until she becomes warm, --before breakfast. Breakfast on cold bread with milk or butter. Walk and drink again after breakfast. At 11 o'clock take a hip-bath from 10 increasing gradually to 30 minutes in water 72 degrees gradually growing colder daily to 30 degrees. Drink again and walk until you get well warmed. Dinner without condiments, pies or rich food. Drink several tumblers of water with dinner and none for 2 hours after dinner. After 2 hours drink and walk. At 5 P.M. take a hip bath of same temperature and duration as at 11. Walk again and after every bath and drinking. Take supper as early as 6 same as breakfast but quite little. Take a foot-bath before retiring 10 to 30 minutes, --temperature 73 degrees to 60 degrees as in other baths, and rub the feet and walk until they become warmed. Take an ear-bath forenoon and afternoon at the Douch house. It's Saturday night! Time for Randy Seaver's Saturday Night Genealogy Fun. 1) When was the last time you had Genealogy Fun? It could be research, conferences, a society meeting, or just talking with friends about your research, a favorite trip, etc. 2) Tell us about it in your own blog post, in a comment to this post, or in a Facebook status or comment. I had some genealogy fun today at the Greater Portland Chapter of the Maine Genealogical Society meeting. Our scheduled speaker had to postpone her talk due to illness, so I brought in my laptop and projector and we did an online search and strategy session. Lots of fun. We discussed search techniques for Google, Google Books, Ancestry.com, Americanancestors.org, and several other sites of interest. The whole group pitched in with their experiences, hints and tips and we did a few test searches for folks as well. As we grew older, we began to wonder why she had not married, --speculation among the girls of the family was rife on the subject, --as we were told by members of her generation that she had been much admired, and had received many offers of marriage. Indeed we could realize this for ourselves, as her charm, real gayety [sic] and repartee never entirely waned. 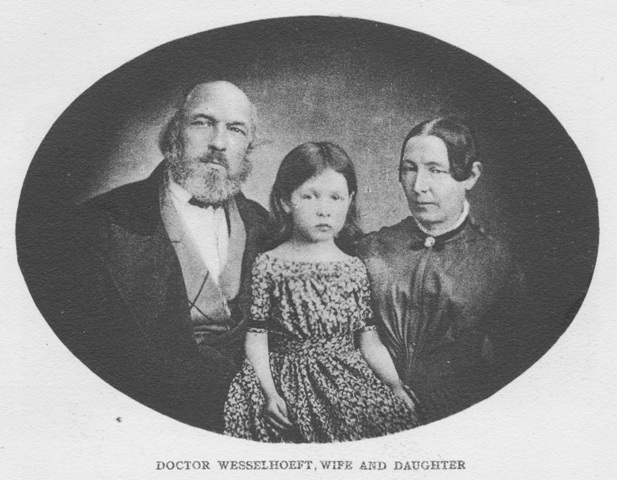 Among the family traditions was a story that, when she was sixteen, she met at the house of her cousins in Medford a young man, George Washington Warren; that he came to Chesterfield, on horseback, to formally declare his affection, which was reciprocated. As Grandfather was going to Boston on business at this time George Washington Warren returned his company. On the journey he extracted a promise from the young man not to write to, or to see his daughter for a year. This was because her father considered her too young to think seriously of love and marriage and he wished to enforce the test of time. Grandfather did not explain, or repeat his conversation with G.W.W. to his daughter. Silently she looked for letters, which never came. When the year of probation was ended and her lover reappeared to claim her hand , she refused to see him. They did not meet again until middle life, after his marriage to another. How much this experience had to do with the very obvious and intense pride of our Aunt Malvina, we do not know. It was also said that her Mother made fun of each of her lovers in turn, and that this unfortunate attitude prevented her marriage in another case. She was excessively sensitive, and gave the impression of one who had suffered from harshness or shock. Her delicate nervous organization was also undermined by the condition of her Father's long and painful illness. Ancestry.com. 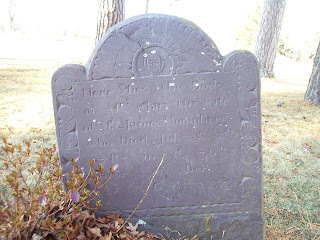 Maine Death Records, 1617-1922 [database on-line]. Provo, UT, USA: Ancestry.com Operations, Inc., 2010. 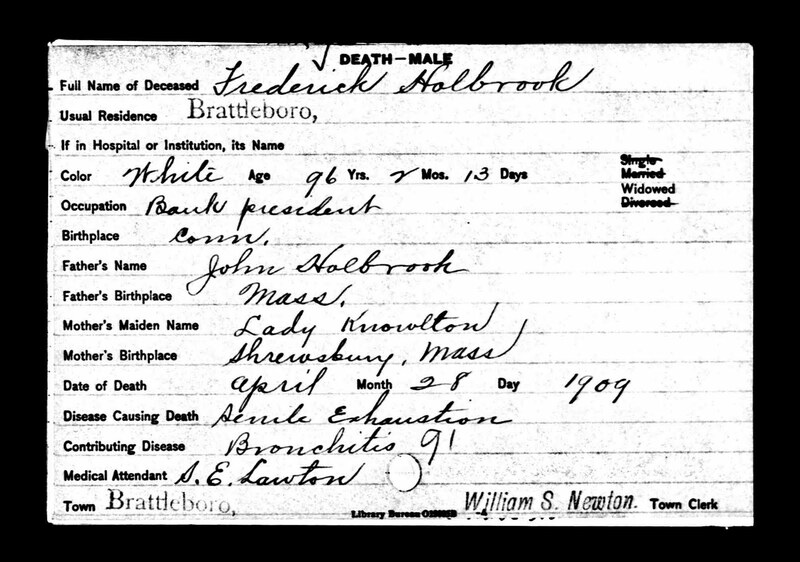 Original data: Maine Death Records, 1617-1922. Augusta, Maine: Maine State Archives. For this week, I am posting the transcription of the obituary for my great grandfather, Frank Owen Haskell. I located this record on microfilm at the Portland [Maine] Public Library in the 30 May 1931 Portland Press Herald on page 2. Funeral services for Frank O. Haskell, 68, assistant treasurer of the Maine Savings Bank, who died Friday morning, will be held at 2.30 o'clock Sunday afternoon at his home, 92 Winter Street. Mr. Haskell was a life resident of this City and after his graduation from Portland High School went into the banking business as a clerk. Since 1913 he had been assistant treasurer of the Maine Savings Bank. He was a member of the Portland Club. Mr. Haskell is survived by a son, Merrill of Yarmouth, and a brother, Charles of Portland. 1. My birthday is April Fool's Day, 1 April 1966 and this was a Friday. I found the day by using a perpetual calendar in the back of my journal which is published by Lee Valley Tools. Now, thanks to FamilySearch.org, I have found their marriage date and location - 12 Dec 1775, South Hampton, Rockingham County, New Hampshire. There was no image of the original record in the database, but now that I have a location, I can try and track down the original record. I check and recheck the FamilySearch site regularly and have not found this record before. This time I specifically went to the New Hampshire Marriages database and searched for "Eliphalet Haskell", date 1775. The record popped up even though the record lists his first name as Eliphelet. South Hampton is adjacent to the southeast corner of Kingston. Wikipedia indicates that Kingston was originally part of Hampton, New Hampshire and its royal charter was granted in 1694. South Hampton was chartered in 1742. I'm pretty excited about finding this. It has been on my to do list for quite awhile. Marriage Record Source: FamilySearch, "New Hampshire Marriages 1720-1920," database, Familysearch.org (www.familysearch.org: accessed 22 January 2011), Eliphalet Haskell & Mary Woodman marriage record; citing "New Hampshire Marriages, 1720-1920," database, FamilySearch (http://familysearch.org/). Index entries derived from digital copies of originals housed in various repositories throughout New Hampshire.. Comments: Rebecca Ross married first, Jasper Johnson, 23 Dec 1784. Jasper was the older brother of David Johnson. Jasper drowned in the Royal River about April 1795. Rebecca then married Jasper's brother David Johnson after David's first wife, Jenny (Whitney) died about 1797. Transcription: DAVID JOHNSON/died/Oct. 29, 1849,/AE. 87 yrs. 6 ms. Comments: David Johnson was the son of James and Hannah (Blake) Johnson. He is my fourth great-grandfather and the father of Sarah "Sally" (Johnson) Haskell. I love old newspapers! There is so much information hidden away inside their pages. Governor Frederick Holbrook was my third great-grandfather. He was the Governor of the State of Vermont during the Civil War. Here is an article I found on the Google News site about Governor Holbrook. The article was originally published in the Mansfield Daily Sheild on March 23, 1901 when he was 88 years old. The Nashua Telegraph published a short article on 15 Feb 1909 indicating that Frederick Holbrook reached his 96th birthday and was the oldest living former governor in the United States. Frederick passed away a couple months after this on 28 Apr 1909 at the age of 96. He is buried at Prospect Hill Cemetery, Brattleboro, Windham County, Vermont. The Town of New Gloucester, Maine was quite prominent in its early days. This town celebrated its 150th anniversary in 1924 and this interesting article in the Lewiston Journal Illustrated Magazine, August 30, 1924 edition describes the celebration activities. There is also a book titled The New Gloucester Centennial, September 7, 1874 by T. H. Haskell, originally published by Hoyt, Fogg & Dunham of Portland, Maine in 1875. This book documents the centennial celebration in 1874. A copy of this book can be found at Google Books. I was lucky enough to be able to purchase a copy of this book at an eBay auction several years ago. My copy is signed by the author - it says "Hon Edwin Fox with regard of T.H. Haskell mch. 26, 1875". This newspaper article was transcribed from an old newspaper clipping in Grace Ware (Holbrook) Haskell's scrapbook. The newspaper title unknown, but based on the death date of Charles A. Haskell, the date of hte article was about June 1931. Charles A. Haskell was the brother of my great-grandfather, Frank Owen Haskell. Charles A. Haskell, who died at his home in this city on Wednesday at the advanced age of 83 years, was a traveling salesman in the days when traveling connoted greater physical difficulties than it does at the present time. The drummer had to sell goods in the old days just as he does now but persuading people to buy was a secondary consideration at the time that Mr. Haskell as a young man, took his sample case in hand and started out to cover Northern New England. How swiftly has come the improvement in transportation methods in this and other states is strikingly brought out by the fact that this veteran, whose days on the road covered a period of but little over half a century, was equally familiar with the stage coach and livery rig and with pullman cars and the automobile. Mr. Haskell was 17 years old when in 1865 he first went on the road. The railroad had come to Maine before that, but the accommodations it could offer to the traveler were extremely limited. One could then get down to Old Town by train, there was a road to Bath and the Grand Trunk was running up to Island Pond. But beyond that the horse had to be depended on and this form of locomotion while dependable was slow. Mr. Haskell had to go down the coast as far as Calais, up into Aroostook county, across Piscataquis and Somerset. He visited as many places as he did later when he could buy a chair in a parlor car or be swept from town to town in an auto, but he had to take much more time for it -- in the Winter frequently much more. As locomotion was slow so were the mails and frequently weeks elapsed when the salesman's house in Portland did not hear from him. But unless storms intervened he, with others like him, made his dates and the counting room here in the city knew that he was pretty certain to be back on time. It was the business of old time drummers to sell goods, but for many years those who followed this business formed the connecting link between urban and rural Maine and save for the weekly newspaper like the old Portland Transcript, were about the only connection there was. He brought the news of the business world, generally knew about politics and echoed the gossip of state and nation wide interest that had not reached the town corners. The traveling salesman of the old fashioned kind was also an advisor and instructor in business methods and many a country merchant owed his prosperity to the fact that he had these men to consult. Not all these travelers were like Mr. Haskell, who was sound and solid as a rock, but as a whole they exerted a profound influence upon the State and were a powerful factor in moulding the society of the commonwealth in the days when communication was vastly more of a proposition than it is now. For this Sunday's obituary, I am posting that of Miss Mary Rogers Cabot, who was the aunt of my grandmother, Grace Ware (Holbrook) Haskell. Compiled Annals of Brattleboro-- Although in Ill Health, Prepared Additional Material. Miss Mary R. Cabot, 75, member of one of Brattleboro's most prominent families, and who perhaps will be best remembered as the author of Annals of Brattleboro, in two volumes, which she compiled and edited in 1921, died at 7.30 o'clock Saturday morning in her Terrace street home after a lingering illness. For the past month, she had been confined to her bed, and previous to that time she had sat up most of each day and had done a good amount of writing. She possessed a keen intellect and retained her faculties almost to the end. Mary Rogers Cabot, the oldest of the four children of the late Norman Franklin Cabot and Lucy T. (Brooks) Cabot, was born in Brattleboro Aug. 20, 1856, in the so-called Felton house, which formerly stood near the corner of Main street and Harris place. Her father was treasurer over 29 years, or until his 82d birthday, of the Vermont Savings bank. He build the present home on Terrace street in October, 1878, and this had since been Miss Cabot's home. It had been her custom until recently, to close the house during the winter months, and during that time she traveled extensively. The four children born to her parents were: Mary R.; Horace E., who died at the age of three years; William Brooks Cabot of Boston, who has been for some months with his sister in Brattleboro; and Grace (Cabot) Holbrook, who died Feb. 9, 1929, and who was widow of Frederick Holbrook. Mr. Holbrook bought Naulahka, the home of Rudyard Kipling, which is now the property of his son, F. Cabot Holbrook, and Miss Cabot spent some time there. Norman F. Cabot died in Brattleboro May 6, 1913, in the 93d year of his age and his wife who was a daughter of Capt. William Brooks, died April 5, 1912. Miss Cabot leaves her brother, William Brooks Cabot, and several nieces and nephews, among them being F. Cabot Holbrook of Brattleboro and Mrs. Grace (Holbrook) Haskell, wife of Merrill Haskell of Portland, Me. She also leaves several cousins. Miss Cabot has been president of the Brattleboro Mutual Aid association since July 8, 1907, the year it was organized, and was deeply interested in its welfare. She was a member of the Daughters of the American Revolution, and of the Colonial Dames of Vermont. She joined the Centre Congregational church in 1877 and later united with the Episcopal church, but never lost her affection for the Centre church. For some time Miss Cabot had been gathering material, as yet unpublished, as an additional contribution to Annals of Brattleboro. A set of the Annals is in the Brattleboro Free library. A set in the offices of The Phoenix is considered very valuable for reference purposes. The Annals are by far the most important history of Brattleboro ever published. I have been practicing minimalist blogging lately, due to a number of factors. I hope to get back to regular posting soon. Take care. The following obituary for my great-grandmother was in my grandmother's, Grace Ware (Holbrook) Haskell, scrapbook. The date 2/9/29 is written in pen at the top of the clipping. Name of the paper is unknown. Grace Cabot Holbrook's gravestone in Prospect Hill Cemetery can be seen here on the Find A Grave website. MRS. GRACE CABOT HOLBROOK DIES. Daughter of Late Norman F. and Lucy Brooks Cabot Was Widow of Widely Known Civil Engineer. Mrs. Grace Cabot Holbrook, daughter of Norman F. and Lucy Brooks Cabot, whose death took place Saturday, Feb. 9, at Naulahka, was born in Brattleboro June 25, 1861. Her education began in the private schools of Brattleboro, followed by three years (1878-1881) at St. Agnes' School. Albany, N.Y., where she made an intensive study of music. She married, April 12, 1887, Frederick Holbrook, son of Col. F. F. and Anna Nourse Holbrook of Boston, and grandson of Gov. Frederick Holbrook, in whose family here his boyhood was spent. Mr. Holbrook's civil engineering activities took them at first to Pocatello, Idaho, at that time an Indian reservation, but they soon returned east and lived iin suburbs of New York and Boston, until they made the city of Boston their residence n 1910. After the death of Mr. Holbrook in Paris in 1920, Mrs. Holbrook made her home at Naulahka, which under her influence became a place of generous and gracious hospitality. Her musical afternoons with Perabo and Mahn were notable events of the summer season. Her love of children brought the children of relatives and friends to Naulahka, as to a spacious playground all their own. Students from other countries, to whose education she was contributing, found with her a home, for the dominant characteristic of Mrs. Holbrook was an unselfish interest in the lives of others. It is not too much to say of her that she never failed in personal sympathy and practical help to any one in need, or any cause presented to her as tending to promote human well-being. Mrs. Holbrook's oldest daughter, Lucy Brooks, died Jan. 28, 1909, at 21 years of age. Her surviving children are a son, Frederick Cabot Holbrook, who lives here with his wife and two children, and a daughter, Grace Ware, now Mrs. Merrill Haskell of Portland, Me., who has a young son. She also leaves a sister, Miss Mary R. Cabot, of Brattleboro, and a brother, William Brooks Cabot of Boston. Largely attended funeral services were held at 3 o'clock on Tuesday, at St. Michael's Episcopal church, Rev. Harry R. Pool, rector, officiating. The choir rendered music, with Lucien Howe of Boston at the organ. The honorary bearers were Charles A. Harris, Harry P. Webster, J. Gray Estey and E. C. Cockayne of Wollaston, Mass. Burial took place in the Cabot family lot in Prospect Hill cemetery. Those who attended the funeral from out of town were Mrs. Holbrook's daughter and husband, Mr. and Mrs. Merrill Haskell of Portland, Me. ; Percy Holbrook of New York; Mr. and Mrs. William Brooks Cabot, J. Randolph Coolidge, Mr. and Mrs. Richard C. Ware, Richards M. Bradley, A. L. Pattie and Mrs. Hugh Hatfield, of Boston; Miss Alice Waite and Miss Louise Waite of Wellesley, Mass. ; Mr. and Mrs. Henry M. Lane and Mr. and Mrs. John Kirkland Clark of New York; Rev. Chalmers Holbrook of Millbrook, N. Y.; Mrs Francis Goodhue of Germantown, Pa.; Mrs. Richard L. Cary of Baltimore, Md. ; Dr. A. M. Hurlbutt of Stamford, Conn.; Mrs. Edward Armstrong of Princeton, N. J.; Mr and Mrs. William R. Moody of Northfield, Mass. This chart continues from Grace Ware Holbrook Ancestral Chart 1. This chart begins with Sarah Knowlton b. 2 May 1767. Surnames on this chart include: Goodhue, Holland, Howe, Knowlton, Park, Pitts, and Watson. Note at the top of the page indicates she copied this information from E.M.H.A. or Emerline Mason (Holbrook) Armstrong who was Grace Ware's aunt.